Idaho’s 22-year venture in FBS has resulted in an 85-174 cumulative record and three bowl wins, including the Famous Idaho Potatoes Bowl last year. After losing five league games by a combined 24 points in a star-crossed season, though, there will be no bowl for the Vandals this year. Freshman Colton Richardson will likely get his first start at quarterback on Saturday when the Vandals wrap up their season at Georgia State in Atlanta. After Mason Petrino re-injured the shoulder he first hurt in fall camp, Richardson came on in relief against New Mexico State last week. He finished 18 of 33 for 167 yards with a touchdown. Mason Petrino is out for the game against the Panthers. However, Idaho coach Paul Petrino said four-year starter Matt Linehan is holding out hope the hand injury he suffered against Troy Nov. 2 will heal enough for him to play a final game against Georgia State, but it is unlikely. In practice on Tuesday, Linehan was still not wearing pads or attempting to throw, and his hand was wrapped. Richardson will benefit from a game plan tailored to his strong arm, Petrino said, and having played most of a game against the Aggies should enable Richardson to call plays, recognize defenses and get the Vandals into correct protections more easily than he did last week. Idaho’s other freshman quarterback, Dylan Lemle, who has not played, will be Richardson’s backup. With 88 yards, senior running back Aaron Duckworth, the Sun Belt’s leading rusher with 912 yards, could record the 14th 1,000-yard rushing campaign in Vandals history. 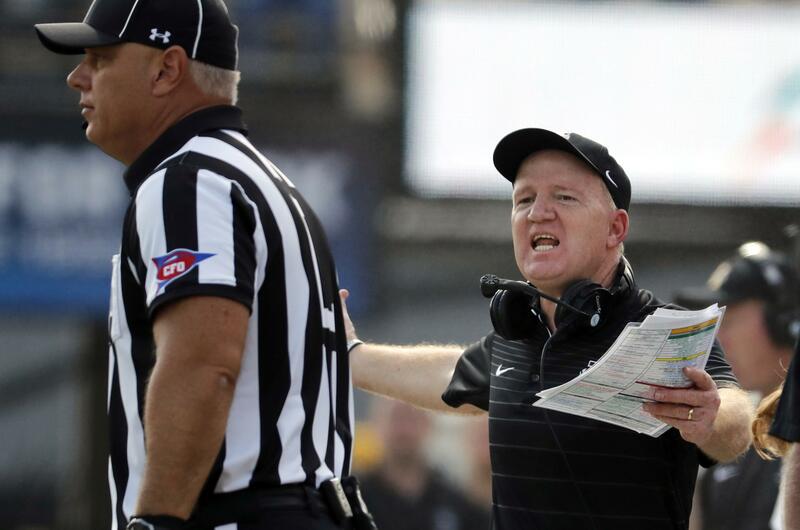 Defensively, the Vandals will need an aggressive pass rush against the Panthers, according to coach Petrino. Aikeem Coleman, Kaden Elliss and Leonard Hazewood lead Idaho with four sacks apiece. Arie Anderson has three, Zach Cable two and Tony Lashley one. For the second straight year, Lashley leads Idaho with 107 tackles. Manning has thrown for an average 259.9 yards per game and has passed for 13 touchdowns. His 64 percent completion rate leads the conference. Petrino said he has not made a point with his players about Idaho playing its final FBS game. The motivation this week will be sending the seniors out with a win. A victory against the Panthers might strengthen a foundation for next season, Idaho’s first back in the Big Sky Conference, where the Vandals played from 1963-1995. Published: Dec. 1, 2017, 9:26 p.m.